Anyone else remember having school milk? I remember in nursery and thereafter for some years having these very small bottles of milk every morning at school. They could of been no more than a third of a pint. Good kids were milk monitors – what was it like to be one? No idea! Some kid had a note in for the teacher saying he was not to have school milk, it was disgusting. Yet the milk monitors used to bring it in and distribute it and try and force him, he was probably the kid who had an allergy to it and was next seen slumped in the corner. Yes, it was tough in the seventies when you 5 years old. School milk was definitely forced on you and left you with a milky moustache until lunch time. I remember the bottles with a straw provided at my Infants school. What was even worse was the milk was nice and warm, just about developing some biological film of butter or yoghurt before consumption. Consuming the little 1/3 of a pint bottles of milk was a memory that others must of come across in there early years. I’m told that “Thatcher the Milk Snatcher” was to blame for the disappearance of this truly nostalgic memory. This entry was posted in LunchBox and tagged 1950, 1960, 1970 by Skooldays. Bookmark the permalink. I hated school milk. We'd always have it before morning break. I'd wait until the other kids went out to play and then chuck it down the classroom sink. It was a blight on morning lessons, and I for one was overjoyed when it was 'snatched' away, never to return. School milk and awful school dinners have to be placed in perspective. In the 1970's most teachers and dinner ladies had experienced post-WW2 austerity first hand. Rationing didn't end completely 'till 1955. Food had been in short supply. I imagine that's why – 25 years later – us kids turning our noses up at warm stale milk or stodgy semolina was seen as such a moral crime. No you do t Pratt, it was withdrawn in 1971! 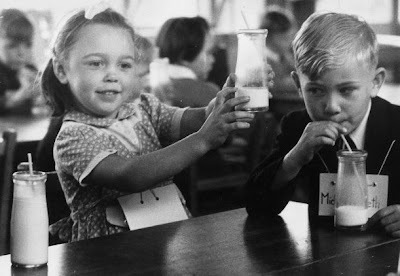 Yes I remember having school milk in the infants school, we had to take turns in giving it out and most days they had some left over so some kids were given a second bottle later in the day. 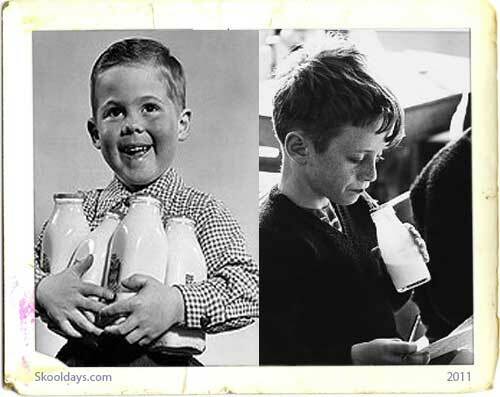 If you lived in England, school milk was often frozen! I loved school milk! If I’d had to drink warm milk every day, yuk! Childhood experiences make a big difference to our habits later in life!! I was born in 1975 in West Yorkshire and would love to get a couple of the little milk bottles that were around at the time. Any ideas where I could get hold of some? Maybe a Country Show in Yorkshire? In Australia in the 1950s the milk bottles were 1/3 pint. They used to leave them in the shelter sheds early in the morning & by recess time the milk was warm! And remember having milk well into the 1980s so can’t believe it was stopped in 1971??? You wouldn’t have caught me dead drinking the milk out of the crates on those school mornings, for fear of it being warm or worse some kid sneakily taking the silver tops off and slagging in the bottle or licking out the cream and putting the silver top back on. I wasn’t fortunate to be a school monitor – let’s face it who would want to stand in the sun handing out warm bottles of milk to be shunned by the other kids. But if you were smart like me you got to be a responsible student the teachers trusted – who would do their washing up of cups and saucers from the morning and in the friedge would be all these cute bottles of white fluid chilled to perfection. Each time I washed up there was more and more bottles of milk – I could drink and manage to skull at least 13 of those bottles. In the end had to request the help of another student to wash up as there was so much milk to share. Does anybody know what dairy provided the free milk? Was it Express written on the bottles? Camberley 1975. I was a 6-year-old Canadian kid living in England for about 1.5 years. I remember the “school milk” there and yes, it was disgusting. It smelled and tasted awful. Each kid getting a straw and a glass bottle. We’d hold our noses before stabbing our straws through the cream into the warm unhomogenized milk. Surely it was spoiling while it sat waiting to be distributed, but we dutifully drank it each morning. I have smelled that particular spoiled milk smell only twice since that time and it brought me right back.